Conceptual modeling is a creative, social process that is driven by the views of involved stakeholders. 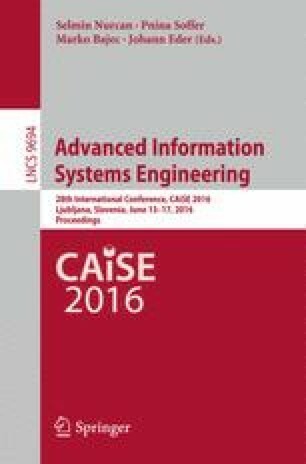 However, few systems offer view-based conceptual modeling on the Web using lock-free synchronous collaborative editing mechanisms. Based on a (meta-)modeling framework that supports near real-time collaborative modeling and metamodeling in the Web browser, this paper proposes an exploratory approach for collaboratively defining views and viewpoints on conceptual models. Viewpoints are defined on the metamodeling layer and instantiated as views within a model editor instance. The approach was successfully used for various conceptual modeling languages and it is based on user requirements for model-based creation and generation of next-generation community applications. An end-user evaluation showed the usefulness, usability and limitations of view-based collaborative modeling. We expect that Web-based collaborative modeling powered by view extensions will pave the way for a new generation of collaboratively and socially engineered information systems. This research was co-funded by the European Commission through the FP7 Integrated Project “Learning Layers” (grant no. 318209).